My files are deleted immediately, without possibility to access them in Trash. I tried to change the privileges and tried to find Trash in terminal. Nothing helps. You can solve this via the Terminal although you need to be even more careful than usual in entering a command there, as you could delete other files if you don’t copy and paste (or, type in) the exact sequence—it won’t just fail, but could delete parts of your drive. You should first be prompted for your account’s password; enter it, and press return. Log out of your OS X account ( > Log Out [user name], which closes all programs) and log back in. 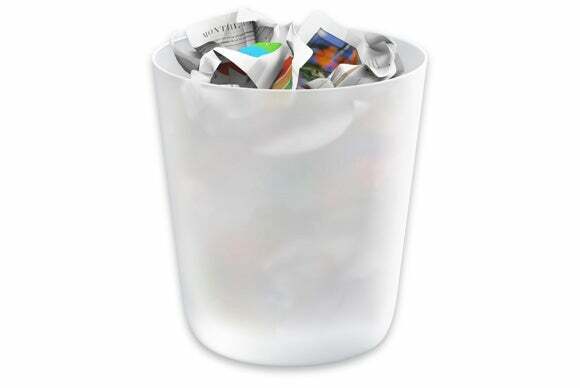 The problem should be solved, as OS X will create a new .Trash folder with the correct permissions. If you continue to have problems, you may have permissions problems on mounted drives. You can repeat the above operation for each volume, which contains a hidden top-level .Trashes folder with separate folders for each user in OS X. In step 3, instead of ~/.Trash, you use each volume’s name instead. In OS X, you can type df -H to find the names of each volume, which are listed under a Mounted On column in form /Volumes/ plus the drive’s name. Type sudo rm -ri plus a space. Drag the volume onto the Terminal window, and it inserts the properly formatted volume name.